Vacation rental cottage. Sleeps 6, 3 bedrooms, 1.5 bathrooms. Cats, Dogs allowed. Welcome to adorable Fish Camp Cottage! Yes, this cottage truly is this charming! Exterior view of Fish Camp Cottage. Please note that while there is a picket fence for the entire yard, there are some areas where the fence is not 100% secure. If your pet is an escape artist- we recommend you not leave your pet un attended. We take great pride in our cottage garden. 100% organic using no pesticides or toxins. Birds, the honey bees, the dragon flies - all love to enjoy our flowers! We love the colors of our cottage. Second bedroom - this bedroom features a queen bed. Another view of full bath. TV/family room; comfy and cozy! Great for watching TV and relaxing on Tybee Tyme! TV/family room features a new, 37 inch flat panel high def TV and a Blue-ray/DVD player! Another view of master bedroom. Master bedroom features a queen bed and a separate entrance to the garden. Exterior view of Fish Camp Cottage. Another exterior view of Fish Camp Cottage. Another exterior view of Fish Camp Cottage. Enjoy beautiful gardens with outdoor seating and gazebo; also enjoy garden views from the wonderful screened/sleeping porch! Cute yellow Front screen door at Fish Camp Cottage! Screened porch with reading area, bistro set and desk. Another view of screened porch. Seats for a magical feel! Another view of gazebo and size of Fish Camp Cottage. Another view of gazebo at Fish Camp Cottage. Awesome outdoor shower off of second bedroom! Cute, cute colors and decor! Perfect for washing off the beach sand before heading indoors. Another view of outdoor shower. Additional exterior shots of Fish Camp Cottage exterior and beautiful landscaping and grounds! The sunroom also serves as a bedroom with twin bed with trundle. This room overlooks the beautiful cottage garden. Cozy sunroom/sleeping porch. Relax in history! Another great view of the sunroom/sleeping porch. Wouldn't you love to sleep here waking up to the garden views from the windows? Entryway from sunroom into kitchen; "Leave your worry at the doorstep"...this entry features an original piece of art by one of the owners entitled "Cottages"! Bright cheerful kitchen featuring all the amenities! Enjoy your free complimentary sample of Mermaid Morning Bliss coffee while here and remember it is available for purchase in full-size bag at Seaside Sisters on Tybee. Proceeds go to sea turtle preservation on Tybee and throughout the world! Another view of kitchen; washer and dryer also housed in the kitchen. Kitchen view showing washer and dryer. Cute yellow shelf unit off of kitchen. View leading out of kitchen and into second bedroom. View of door in second bedroom leading out to outdoor private shower. Another view of second queen bedroom. The full bath; very bright and cheerful! This full bath features a shower/tub and a window that overlooks the back garden and marsh. Another view of TV/family room. Office/library sites between the master bedroom and bath and the TV room. Window looks out to the side yard and garden; is completely light-filled! There is a door at the library for privacy in the master bedroom. Welcome to the master bedroom! Another view of master bedroom with queen bed. Private door to front yard. Another view of master bedroom from the queen bed. Master bedroom leads to the large closet and office space. Entry to new half-bath in master bedroom. 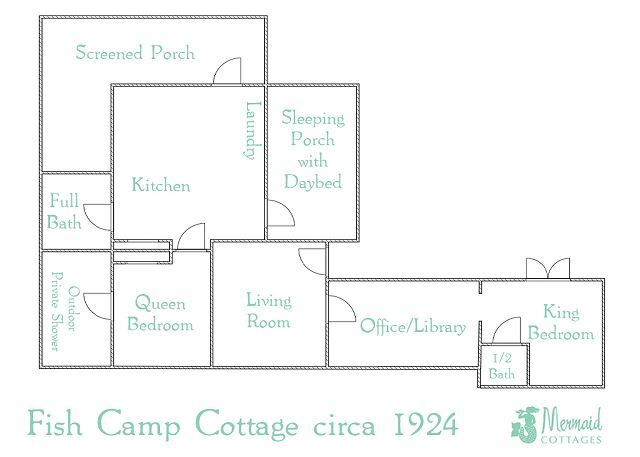 Floor plan for Fish Camp Cottage. We love this bright and cheerful cottage and she's been a covergirl over the years! Please note that while there is a picket fence for the yard, the yard is not fully secure to leave pets or small children in the yard unattended. Fish Camp Cottage is filled with art, comfy beds to snuggle, and a garden to dream and relax . The family room has a 37" High Def TV with Blue Ray/ DVD player! Screened porch, hot and cold outdoor shower off 2nd bedroom, pet-friendly, partial marsh views from the back deck and porch, simple cottage living at it's best! High speed internet and wifi allows you to stay connected while you're re connecting with your friends and family. Adorable little Seabiscuit Cottage is 2 doors down, A Shore Thing is 3 doors away for families wanting to stay close by, and Tybee Tides is right behind Fish Camp. Coastal Joy is across the street! You could have a whole Mermaid extended family gathering! We are a one block walk to AJ's Dockside Restaurant- the best place on the island to watch sunset and enjoy dinner and drinks. 6th Ave is also the location where the Miley Cyrus Movie, "The Last Song", has all the church scenes filmed. NOTE: The 3rd sleeping area is the sunroom with daybed and trundle. This room is open to the kitchen and not a private bedroom. Complimentary off-street parking for 3 cars. Minimum Age Requirement: Must be 25 years of age to rent this property. All pet friendly homes require an additional pet fee. Please pick up after your pets! Please note: Longer minimum stay requirements of up to 7 nights will apply during certain times of the year including holidays and our summer season. Family Books for all, Pets Welcome! 99 % of our reviewers would recommend this vacation rental. Fish Camp Cottage was about as comfortable and as quaint as you can find. Super nice play to stay -- and our dogs loved the yard. Definitely one of the nices places we've stayed on the island. We were luckily able to stay the entire week at Fish Camp as hurricane Florence stayed away. The cottage was perfect for our family and dogs. The service Mermaid Cottages provides is wonderful, which is why we have been staying with them for the past 10 years. Thank you so much! Fishing Camp is rustic, charming, comfortable and immaculately clean. We were here the week after Labor Day, and it was quiet & laid back. Of all the places reviewed, this was the best place for us to be. The people on Tybee make you feel so welcome. Truly a wonderful place to be! We had a wonderful experience at Fish Camp Cottage. The cottage is just as much a part of the vacation experience as any of the adventures we went on around town. Every part of the home was neat and carefully designed to feel like such a magical place. The house was neat and clean. Mermaids brought us a dog crate which was awesome! Quiet area and lives the screened in porch. Was hard to keep the house cool. We have rented cottages from Mermaid For several years. It is always aneasy and pleasant vacation. Fish camp is a very quaint little cottage located in the quieter marsh section of Tybee. We enjoyed playing games around the kitchen table with our teenagers and their friends. We could easily walk to the pier, beach and restaurants. I spent a lot of time on the screened porch enjoying the quiet in the evenings. The kids made s’mores around the fire pit. There is nothing like the Fourth of July in Tybee. Why we come back year after year! Had a great stay. We truly enjoyed it. Really liked the kitchen and outside screened-in porch. The location of Fish Camp allows you to watch the sun go down from the screened-in porch. The ladies at Mermaid were excellent as usual. Jennifer's got a good sense of humor. We had an absolutely wonderful time at the Fish Camp. Everything that we needed was provided. There are so many cute things everywhere you look. We enjoyed sitting in the screened in porch and also sitting outside around the fire pit. The cottage is so close to everything that we rented bikes and never used our car. We will be back the Fish Camp next year!! I contacted Diane last minute to add an extra night, and she was very sweet and prompt! The house was immaculate when we arrived! The beds were comfortable, everything was well maintained and in working order, and aesthetically, the house and grounds could not have been more adorable! We will be telling others to book it and hopefully staying again sometimes ourselves! Sadly, we only had a 3 day week end escape from North Atlanta. We are fans of Tybee and Mermaid Cottages, but it was our first stay at The Fish Camp! It was perfect for our group of four! And our dachshund loved the yard! The Mermaidrs made sure we did not want for anything! The weather was fab, A.J. 's was delishous, the ocean was beautiful and the stars could not have shown brighter‼️ Thank you, Mermaids, we'll see ya soon!! I so enjoyed my extended stay at The Fish Camp. It was a wonderful time. Diane was very helpful and answered any questions promptly. The neighborhood was delightful Marley and I enjoyed our walks and bike rides around the island. I wish I didn’t have to leave. We loved the cute Fish Camp Cottage! It was charming and kid friendly. We didn't love the icy, snowy weather. Even with two space heaters, the little cottage was still really (60) cold. The little furnace sounded like diesel engine right outside the second bed room (really loud!). The Mermaids were very kind about dropping off space heaters, so we didn't freeze. There were also rodents sharing the master bedroom on the other side of the wall. We were so happy they weren't in the bedroom, but there sounds kept us up many nights. Thank you for our feedback- as you know with many of these vintage cottages on Tybee Island- we are always working to make the homes the best they can be. The HVAC system had parts ordered but we couldn't get them in on time prior to your stay. The not invited visitors to your home have been asked to leave and we were are working on making sure they can't return. We thank you for your patience and hope you'll give us another chance to visit. The Mermaids. The cottage was a tiny bit smaller than what I thought it would be but it was still accommodating and enjoyable to relax in when we weren't out on the beach or strolling the streets of Tybee! Lots of Fun at Fish Camp! My husband and I enjoyed this house so much. The kitchen was wonderful and had everything we could possibly need. Our family that was in another house just down the road came over for breakfast one morning and there was plenty of room between the table in the kitchen and putting extra chairs around it. The grandchildren came down for a game night and that was so fun! The side porch just off the kitchen was a great place for reading and having that first cup of coffee in the morning. It was also perfect for storing beach chairs and the cart. We were impressed with the large selection of books and movies that we could enjoy if needed. The office space was perfect for setting up our computer. The bedrooms were wonderful and we slept so well. The sun room was so inviting and the perfect place to read or nap.The landscaping of this house was gorgeous and beckoned us to come out side and enjoy the yard. We would have used the fire pit if the weather had been cooler. The outside shower made for the perfect place to clean up after a fun time at the beach. We love the location and so did our dogs on our frequent walks back along the marsh where the breeze blew and the road was not at all busy. The only thing we had some problem with was the WIFI connection was weak but that could be easily corrected with a different router. We will definitely want to stay in this house again because we loved the location and the wonderful flow of the house.Our Mermaid contacted us to make sure everything was well. I can not thank them enough for their attention to us each and every time we have stayed in a Mermaid Cottage. Also a big thank you to the owners for their excellent attention to details that insured comfort for us.I would also thank them for allowing their house to be pet friendly. It is a great relief to us to have our girl with us and makes me enjoy our time at Tybee Island even more. Thank you Mermaids for another amazing time with you! Such a great house and yard! As our second Mermaid Cottage rental, we didn't think Fish Camp would live up to our precious rental, but we were very mistaken. This house oozes character and has all the comforts that made our vacation memorable. The kids loved the amazing yard and the outdoor shower! My only complaint was not enough days! Our stay was great! My wife had not seen pictures before we arrived but she fell in love the minute she saw it. She says it is her favorite place we've stayed at on Tybee, and we have stayed at many places over the past 20 years. It is small but the layout makes it seem like it is not. The outdoor shower is awesome! We loved Fish Camp Cottage! Will definitely stay here again! We had such a fantastic stay and vacation at Fish Camp! The cottage was the perfect size & set up for our family of 5. The yard was awesome! Our kids enjoyed it very much. The beach was great. Our day trip to Savannah was wonderful. We've stayed on Tybee a handful of times and this was our favorite cottage of all. We had a wonderful girls weekend! Thank you so much! Fish Camp - Simply Adorable! Fish Camp and Mermaid Cottages earned every bit of the 5 ratings I gave them. The cottage itself couldn't have been cuter, and it was the perfect size for a girls' getaway with my mom. It was wonderful to have our own rooms, and we loved having our coffee and breakfast out on the screened porch. It was fully stocked with everything you could need to cook (pans, utensils, etc. ), it had two hairdryers, and it was great to be able to do laundry. Lots of great DVDs, books, and games throughout the house, and the decorations and special touches throughout the cottage were obviously chosen with care and created just the right atmosphere. The sheets in my bedroom even had little seahorses on them. The Wifi in the house was a little touchy/slow, but it was fine for our phones and things like social media (but not for logging on and doing serious work, which forced me to actually be on vacation - thank you!). Location was exactly what we expected - the marsh and beautiful sunsets were just around the corner, as was good food at AJs. The beach was a quick walk, although we chose to drive over and park so we didn't have to carry chairs the 5-6 blocks. We walked to dinner on Tybrisa easily. It was QUIET - first time in years I've slept without a noisemaker and got to enjoy silence. The service from Mermaid Cottages was great. The TV was missing a cable when we arrived, and the IT support man Michael came over at 9 pm on a Sunday night to fix it. We broke the coffee pot and had a replacement within hours. The house was super clean, and we had notes from our housekeeper Reba welcoming us. All of the email instructions we got before arriving were perfectly detailed, and the coffee table book had everything we needed to know about the house and Tybee. Incredibly well thought out and executed customer service. We were looking for a quiet, low-key vacation, and Fish Camp delivered perfectly. We were sad to leave, but we'll definitely be back! Absolutely wonderful in every way. Age of cottage provides its charm. Decor is typical Tybee quirky and beautifully done. Location perfect for walking to nearby restaurants. Staff very helpful and understanding whe we had to change dates because of an ice storm the day we were to leave VA. I had the most wonderful time staying at the Fish Camp Cottage on a short vacation I recently took. It was cozy, clean, beachy, everything I was looking for in a vacation rental. It's close to the beach where there is lots of fun shopping and good restaurants. I will be making this an annual vacation spot. Beautiful home! Cozy and comfortable perfect for dog with its fully fenced in yard. Enjoyed a bonfire and sitting in the cabana to look at the stars. Conveniently located near aj's, pier and back river. Ideal for a getaway and some quiet time. Thank you. My husband and I arrived at Fish Camp Cottage with our Labradoodle, Jack and fell in love immediately! The cottage is adorable and the fenced yard, porch and fire pit area suited our needs perfectly. The cottage has everything a traveler may have forgotten (nightlites,fans,hairdryers,dog bowls...you name it!! Although we went out to eat most of the time I did notice the kitchen has everything you might need. We look forward to returning to this little piece of paradise!! The Fish Camp and Mermaid Cottages Rock! The Fish Camp cottage was awesome, decorated so cute and had everything you would ever need- loved all the books, movies and board games provided- the fire pit was great, too. Lots to do and see at the cottage and on Tybee Island. The staff at Mermaid Cottages are wonderful and made sure we had everything we needed and were very gracious. We will be back?? Great, Home away from home! This place had everything you needed or wanted, plus a lot more. Cooler, plenty of dishes, pots, pans, filtered water etc... We have stayed in places like this for 20 years and this place was stocked with things other places didn't have. My only things I would say, I was disappointed in was our cottage did not have the started coffee that was promised. I was looking so forward to trying that coffee. Other than that I we were very happy with our wonderful stay. We loved everything about our stay in Tybee Island. Fish Camp had lots to do within walking distance, was cozy, and full of everything we needed. We spent lots of time on screened in porch. We spent a wonderful on Tybee. The charming cottage with its well equipped kitchen enticed us to spend many fun meals around the kitchen table in great company. Charming little cottage, plenty of room for the entire family! Look forward to staying there again. This is our second time staying in Fish Camp. We loved it the last time, and there were many small improvements that made it that much better this stay. Blinds on the sun room windows kept it much cooler and the girls loved sleeping in there. Stones added around the fire pit were awesome. We roasted marshmallows. Easy walk to 13th Street beach. I Little Bit of Beach Cottage Paradise! The cottage was sweet and adorable. Everything was clean and neat. We enjoyed our stay and would love to return to this cottage in the future. The outdoor shower was amazing and a light breeze blows through the yard. Don't expect artic cold ac, however, we were plenty comfortable. Thanks for an amazing vacation! Can't wait to return! A great place to stay!! We had a lot of fun on our trip to Tybee! It was so nice to come back to a house with a yard instead of stuck in a hotel room with our two year old. We used the firepit to make smores, we really enjoyed the yard! The only thing I can complain about is the washer mashing stunk so bad but I had planned on washing clothes there so we were put of clothes and I needed to. I was really afraid of what the clothes would smell like. If th ey clean the washer machine it would have been perfect. We did have! some bad weather but otherwise absolutely no complaints! Fish camp is so adorable and was exciting to be in! We had a wonderful stay. We spent 6 nights here in early May. It was originally supposed to be 5 but we loved it so much we added a night! The cottage was beautiful, we especially loved being near AJs and the screened in porch. Hope to be back soon! We really enjoyed Fish Camp Cottage. My Wife really like the vintage feel of this cottage. We thought it was very interesting about the Miley Cirus movie being filmed nearby. We saw the photo album, in the cottage, and my daughter was a big fan of Mileys. Also, coincidentally a new movie was being filmed at the pier. The area is very nice and we were able to also spend a day in Savannah. That was great too. We are very satisfied with our entire experience and look forward to returning in the future. Everything was as described. The cottage was cute and functional. Good location. We were surprised at how well furnished the kitchen was. Everything was there to prepare any type of a meal. Very cute little house! Rich in history! They had everything you could need! Plenty of books in the library. Loved the screen in porch even in the winter! We always stay with mermaids just because of the good care that Mermaid Jan takes with us! If you want a great person who makes things personal choose Mermaid JAN! We will see you guys for SUMMER!!!!! :) BTW the dogs loved the huge fenced in yard! My husband and I stayed at Fish Camp Cottage on Tybee Island for our honeymoon. When we arrived at the cottage Sunday afternoon I couldn't wait to get inside and check it out. I had seen some pictures online but I wanted to see it in person. The cottage is adorable and everything we could have asked for in a quiet and relaxing honeymoon. I loved all the books! My husband really enjoyed relaxing on the screened in porch. We didn't cook much but anything we would have needed was right there in the kitchen. I wish we could have stayed longer to enjoy the fire pit one night. I think Fish Camp Cottage would be a great place to vacation with a family! This was our 2nd time to stay at Fish Camp. We love it! It is perfect for our small family and we love the back river location. Short bike ride to the beach and right around the corner from AJ's! Everyone was fantastic from start to finish, especially Mermaid Jan. Mermaid Jan went above and beyond to make our stay amazing!!! We were celebrating our Anniversary and it was our first time in Tybee and she did make it very special!!! We really enjoyed our stay, meeting the locals and getting to know the area. Fish Camp was exactly like the photos-very quaint, relaxing and well maintained. Everything was so close, we enjoyed walking everywhere we went. We spent a few nights at AJ's for the beautiful sunsets- a must see! Quick walk to the beach. Great breakfast at The Breakfast Club, old style diner atmosphere. Bernie's Oyster House- great happy hour and Sting Ray's for their margaritas!! The highlight of our visit was the Pirate Fest!! Attended the Buccaneer Ball at The Crab Shack and all the Pirate festivities, we had a blast; great food and costumes and the firework display on the beach was amazing! We would definitely recommend staying at Fish Camp and visiting Tybee!! We are already planning a return visit!! Looking forward to Tybee Time!!! After multile stays on Tybee - this place is the best by far!! Had an amazing time, this place is great and the fact that it is so darn cute made the stay so much more enjoyable. Having stayed at Tybee for a numberous times I was impressed with Mermaid Cottages professionalism and follow up. Definately the best place we've stayed at. Fish Camp was Perfect for a Much-Needed Girls' Trip! Sandy, Candy, Trixie and I absolutely loved our girls' trip to Tybee and Fish Camp was the perfect place to stay. After arriving we discovered we needed extra sheets for the pull out sofa. Once we called, the Mermaids were quick to provide sheets and extra towels. We really enjoyed the screened porch and spent hours chatting with our coffee in the mornings and sipping our drinks in the evening. The cottage was walking distance from AJ's and Tybee Island Social Club, two restaurants I would highly recommend. Every morning we woke up early and walked to the beach so we could see the sunrise. We rented bikes from Tim's Beach Gear (who always provides excellent service) and rode all over the island every day we were at Tybee. I hope we can return next year and if we do, I would love to stay at Fish Camp again! Super cute & fun house to stay in! Will make your trip to Tybee even more relaxing! Info does describe it as sleeping 6 people, for us, it was more comfortable with just 4 adults due to the 3rd area not really being a bedroom, probably would be fine for 2 children. Awesome place! This is a really cute place and so close to everything. The rooms are spacious and the yard was very nice with herbs that can be used to cook with. I think this is a place with great character. Adorable photos, but somehow even cuter in person! This was our third stay at a Mermaid Cottage. We've loved each year and each home, but Fish Camp was our favorite. We thought the house was adorable in photos, but it's somehow even cuter when you see in person. Charming and quaint. Beautifully decorated. The grounds were lovely, with so many seating options to enjoy the beautiful yard and landscaping. Our children loved all the nooks and crannies the house offered, and we all felt instantly at home. It was just a truly wonderful vacation, made in great deal to our stay at Fish Camp. We loved the island location, and it was a short distance to south beach, the pier and the busier business districts. Also loved that it was walking distance to AJ's Dockside! We would not hesitate to stay here again. A true gem. We loved staying 2 weeks at Fish Camp cottage. It was comfortable and had everything we needed. Our extended family had both Tybee Tides and Fish Camp cottages. We rent properties at least 3 times per year mostly in Europe and the management at Mermaid was 100% the BEST! Let me set the scene to tell you just how much we loved our time at Fish Camp: two moms and their three girls( 21, 21 and 16) had been traveling all day and drove into Tybee at 9:30 pm, a little cranky and very hungry. We pulled I into the driveway, we sprinted inside and all 5 of us giggled and screamed with joy while running throughout the house for over 10 minutes, taking in every little detail. . The Mermaids have thought of every detail possible. Tons of books and movies and the cutest decor I've ever seen. We all felt so at home and spent our evenings playing games on the screened in porch. This house completely went above and beyond our expectations in every way possible. I can't wait to return to Tybee and our favorite little blue house, Fish Camp Cottage. My family of 5 had a wonderful week at the house. The area is quiet and off the beaten path but still close to everything. We really felt at home in the house and community. "Fishcamp Cottage time stands still"
There are no words to adequately describe this little slice of paradise. Your heart rate slows, and the hustle and sounds of the city become a faint memory in your mind. You learn to shed things, upon your arrival.First ,you lose the shoes, you feel the cool smoothe floor , and then youvcast your eyes on the screen porch, only to hear the door squeek closed behind you. Your body begins to relax, as you melt like butter into the wicker chase lounge, and you fix your eyes on a delicious read, you can't wait to wrap your hands around. The cottage fills you with anticipation of memories you will make, and as you look around, you feel the warmth of the others who have come before you, and you know that you can come back , to fall into the rythem of the tybee , and add years more to your life. We traveled to Tybee with my daughter and several of her friends for my girl's sweet sixteen celebration. We found the cottage to be super charming and beautifully decorated and landscaped. It was the cutest cabin on the island in my opinion. The girls enjoyed watching the wonderful selection of movies provided at the cottage and playing the supplied board games when they were not exploring Tybee. The location is PERFECT and I was lucky to find the Alley 3 beach before the end of the week. Pretty much everything is a bike ride away. The kitchen is stocked with all that one needs for cooking. I did have to purchase a sponge, salt and pepper, and trashbags along with the regular consumables. We also had to piece together coverings for the pullout sofa, as extra linens were not provided. However, the girls didn't mind. I do want to mention that on the evening that we were to arrive, there was a bad wreck on the bridge going into Tybee which closed the bridge for 5 hours or so. We received a call from Mermaid Management telling us of the wreck and to not come to the island at that time. They later called to tell us that the bridge was clear and then called again to ensure that we had arrived safely. That small gesture was VERY appreciated, as it kept us from being stuck in traffic for hours. We would go back to Fish Camp and book with Mermaid Cottages again in a heartbeat! On the website there are plenty of photos of the Fish Camp cottage but when we arrived it was even better in person! It had everything we could ever need during our stay, and then some. It was recommended to us by a staff member of Mermaid a Cottages and described as a "magical place" -- it most certainly was. Every room had an inviting spot to sit and relax in, the sounds of frogs and marsh creatures were soothing and the convenience of location and amenities was perfect. We will be back again. I cannot say enough about this lovely cottage! Pristine, adorably decorated, lovely yard! They have overlooked nothing in this rental home! Located within nice walk to beach, but away from the main stream, so our stay was very quiet. Walked to AJ's for dinner, great food, and located on the water. I most definitely recommend this home!! And hope to return again! Thanks for a great stay!! Fish Camp Stole our Heart! Very cute house, however, was disappointed that it is more a two bedroom than three. The third bedroom is a daybed in an open area. No door to close. We had such a wonderful stay!! The place was clean, convenient, restful and had tons of personality - all things to help make for wonderful Tybee memories with family. We stayed during Thanskgiving so the holiday decor was already up which we LOVED; it reminded us of a little gingerbread house. By far one of our favorite parts of the whole trip was spending time around the fire outside with out pups and family roasting marshmellows. Thanks for a wonderful stay. My family had a wonderful time at Tybee Island staying at Fish Camp Cottage. Enjoyed fishing, food, Pirate Fest all within walking ditance. Truly a memorable experience. We had a wonderful time staying at the Fish Camp cottage. Really quaint and cozy. The town of Tybee stays the same. Not built up at all. That is why we love it. No high rises, etc. We loved A.J's, Marlins, Sting Rays and Macalwees. Great seafood! Also, at A.J's you can watch the dolphins. We're delighted that you had such a great stay at Fish Camp Cottage! We appreciate your review and recommendation and we thank you for letting everyone know how much you love Tybee and why! We look forward to seeing you again soon! The house was so cute and cozy. I't had every thing we could possible need. It was our best beach vacation ever. My only complaint was we chose the hottest week of the year to take our vacation. The house air conditioning kept the temperature between 75 and 80. Thanks goodness for the girl from the Mermaid Cottage office. She brought me a huge fan that I carried with me from room to room. My husband was in heaven though he says I freeze him to death at home. An eclectic cottage design perfect for any beach getaway. We took our family of 6, four kids and two adults to Tybee Island for summer vacation. This cottage was clean and everything the pictures showed. Keep in mind you are in the south . . . while the outside shower looks awesome, mosquitoes are everywhere which made use of that shower impossible in August. The dishwasher does not function properly and has a note on it for how to bypass the function. Still, it didn't work for us. Mermaids said they would come fix if we turned it in, but honestly I didn't have time in our schedule to call and make arrangements. The Mermaids were wonderful to work with prior to our arrival, answering all questions. Fish Camp was super cute! Loved everything about the cottage, especially the screened porch! Enjoyed the chaise lounge every morning with a book and a cup of Mermaid Morning Bliss! The fam and I biked to the 18th Street beach everyday, which is our favorite part of Tybee! Of course we ate out every night! Loved being able to walk to AJ's Dockside. Mermaid's never disappoint! Now if only I could figure out how to afford to stay longer! Fishcamp Cottage was wonderful. Perfect location. We loved being so close to the back river. The cottage had everything and more we needed. Lots of space, very clean and so comfy. Fish Camp is very charming, clean and within walking distance (couple blocks) to the beach. I have recommended it my family and we hope to go back next year. We thoroughly enjoyed Fish Camp, everything was absolutely perfect. The house could not have been anymore better for us. My kids (5 and 3) were so in love with the house. The location is perfect to the beach, we rented bikes from Tim's Beach gear that delivered the bikes right to the house so we rode to beach everyday and took rides around the island in the evening. We mostly cooked dinner at the house and went and bought local seafood daily, when we did go out we went to The Crab Shack, which was Delicious and went for pizza at Huca Poo's which was great too. We will definitely be returning to Tybee, perfect place for a family vacation. Stayed with our 2 teens and 2 dogs. Everyone loved it! Only wish our stay could have been longer. Walking distance to Butler Ave and the beach was good. 4 days of great rest. A Quintessential Beach Retreat In Every Way!! We thoroughly enjoyed our stay at the Fish Camp Cottage circa 1924. The cottage was clean, well-appointed, and beautiful. Every detail was just right. My favorite part was the wonderful screened porch complete with green reptiles! We spent a great deal of time on it. My sister enjoyed the outdoor shower and said that the daybed she slept in was very comfortable. My daughter and I also thought our beds comfy and the sheets were so soft! The kitchen had everything you needed including that great water pitcher in the fridge. Adding one of those plastic covers for reheating leftovers would be good. The ice maker needed to make more ice than it did. We LOVED the Mermaid Cottage Morning Blend coffee and bought some at Seaside Sisters to take home. All the plantings in the garden were lovely and the yard art was fun . 6th Avenue was a great street and we enjoyed riding bikes we'd rented all over Tybee. A.J. 's Restaurant was a short bike ride away and we enjoyed a fantastic seafood meal while watching the sunset from their open air seating area. Spent time on the beautiful, wide beach a number of days and took relaxing walks along the ocean. We had the perfect holiday! Wouldn't hesitate to stay at Fish Camp Cottage again and again. The owners are very lucky people! We rented for a week in April. Unfortunately our first night was during Orange Crush. We had never heard of the event but Mermaid informed us with two emails and a phone call. This was a big help in planning around the crowds and traffic. Huge thank you for that. The house was spotless and was beyond adorable. It feels much bigger inside then it looks from the outside. Mermaids has won over a now huge and loyal fan. I would use them again in a heartbeat. Loved Fishcamp Cottage! Had everything we needed and more. The decor is so cute and cherry, very clean too. We rented bikes, walked to the beach and took a trip into Savannah. Can't wait to return to Fish Camp Cottage! a guest from Decater, Ga does not recommend this vacation rental. cluttered cottage would have been more comfortable for relaxing. This is our second visit to Tybee Island and our second stay at Fish Camp. We love the cottage - it is so charming and well kept. The owners have done an amazing job with decorating the cottage and it is kept in wonderful condition. We so enjoyed our stay - it was quiet and so convenient to everything on the Island. The fenced yard is perfect for our small dogs. We can't imagine a nicer place to stay on Tybee over the holidays and hope to visit again! We Love Fish Camp and this was our second stay. The location is perfect and the Cottage is just as cute as can be. We loved our stay on Tybee and can't wait to go back. Thank you Mermaids for a wonderful visit! This cottage was so cute! Loved the yard and the whole inside of cabin was so neatly decorated! We wanted to BUY this place! My dogs were very happy there also. They had a great time in the yard exploring! We had a blast...our first time on Tybee! We will definitely stay in a Mermaid cottage again. Maybe a different one next time just so we can experience a different cottage...we loved our "Fish Camp" cottage. Thanks for everything! we loved everything about the rental cottage. one of the most adorable quaint places we've stayed. our only complaint is with the parking situation on tybee. i think there should be parking passes for people who are renting. We loved staying here! We have stayed with Mermaid several times and we loved the location of this happy cottage. The Mermaids ALWAYS go out of their way to make sure we have a pleasant stay. I would absolutely recommend staying here it's close to everything and the house had everything we needed. We loved the Fire Pit and the outdoor shower! We came down for the Labor Day weekend and had a lovely time at Fish Camp! Everything was so well provided for and the house was a dream! My daughter even said she liked the bed there better than her own! Everything was top notch from reservation to accomodations. We have already recommended Mermaid Cottages to all our friends and I know we'll stay at Fish Camp again! It is so cozy and comfortable. Some bugs but that's to be expected at the beach. We have been staying with the Mermaid Cottages for over 15 years now and are always pleased with the cottages and the mermaids! Fish Camp is one of our favorites. We've just come back from the best vacation ever!! Staying at Fish Camp was the highlight of our trip! Tucked away on a quiet road (yet within minutes of the beach, restaurants and shops) Fish Camp has it all - beautiful cottage, delightful garden (shame it was too hot to use the fire pit), wonderful outside shower, everything you could possibly need inside and decorated in a style so appropriate for a beach house. It was delightful and we really didn't want to leave. The whole booking process with the Mermaids was first class and although we had no problems while we were staying in the cottage, I'm 100% sure that they would have been sorted out straight away if it had been necessary. Tybee itself was fabulous - I'm not much of a beach person but I couldn't wait to sit on the beach and swim in the sea every day. Great restaurants too, we particularly liked AJ's. Renting bikes and cycling around the island was great fun - good exercise and no parking fees! We did a dolphin tour with Captain Mike and saw plenty which was a real treat. Also went into Savannah a couple of times - what a pretty city and only 20 minutes away. Do the Gospel Riverboat Cruise if you can - fantastic! Although we'd love to keep Tybee and Fish Camp to ourselves it's too good not to share so we shall be recommending it to everyone. My husband, teenage daughter and I can't wait to go back. Stop thinking about it and just book it - you won't regret it! Thanks for all your assistance before and during our stay. The cottage was adorable, the staff were terrific, and we had a great time. Thanks again! Great cottage and the location was convenient. The house was stocked with all the items you need on a day to day basis and was a very relaxing place to stay. Mermaid Cottages was very professional and assisted us the two times we called for small requests. I recommend this cottage, as well as, Mermaid Cottages, without hesitation and I'm sure we will stay at one of their houses again. This is our third year in a row vacationing in a Mermaid Cottages house. We choose a different house each year and the attention to the little details in each house is amazing.This cottage is just too cute and I love the outdoor shower and screened in porch. The wireless network worked like a charm. I just love the customer service and friendliness of the staff. We will be back next year! We had a wonderful time at the Fish Camp Cottage and hope to come back next year! Our stay was very comfortable and relaxing. We love renting from Mermaid Cottages. I came across designer and artist Jane Coslicks blog one day and read her story about salvaging and restoring old cottages on Tybee Island which is how I found Mermaid Cottages. The staff at Mermaid Cottges were very friendly and professional and made sure we had everything we needed to ensure we had a wonderful stay. It was nice to get out of run of the mill hotel chain room and stay in a charming renovated cottage from the past. The collection of cottages that Jane has salvaged and restored are just so charming and her decor and colors give every cottage a individual beachy feel. Many of her cottages have been profiled in "Cottages and Bungelows" magazine as well in other books. We loved Mermaid Cottages and had a wonderful stay on Tybee! My daughter just adored this cottage! The gardens are lovely and it is a cozy getaway! Highly recommend it. Both bedrooms are now queen beds. No king bed. Minimum Night Stay Requirements will apply throughout the year including holidays, spring break and our summer season. Please check with our Mermaid Reservations Team at 912-704-4618 or visitmermaid@gmail.com for the dates you are considering.